One of the worst aspects of living on a budget is actually creating one. It takes time and a lot of work, right? That combination is the worst for procrastinators like us. So what is the solution? Here are a few ways to cut corners, create a budget, and not work too hard at it. 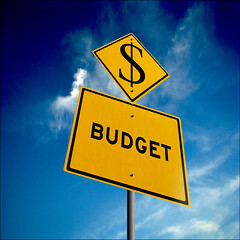 The first step to any budget is to track spending. Many people recommend tracking every expenditure for three months. Now, that is a lot of work…unless. Unless you simply put every expense, whether it is a monthly bill or any other purchase, on one credit or debit card. That way the card issuer tracks the spending for you and all you have to do is keep the statement. Step two gets a little involved, so grab a snack. Grab a piece of paper and a pencil, erasing is easier than rewriting the whole thing. Make a list of what you need to buy or do over the next three to six months. Everything from new tires for the car to airfare for your vacation to your average grocery bill. Include any financial plans like paying off a credit card, IRA contributions, or padding your savings account. Divde those costs over the three to six month period and you have your budget (call it a spending plan if it makes it all seem less dirty). Now, it is time to stop the madness. The madness being all of those unnecessary purchases. With your plan in hand, figure out your walk around money. Put that in your wallet or purse and when that money is gone, stop spending. Simple, huh? Probably not the first few weeks. If it were, NC credit counselors would be out of a job. Changing your spending habits is hardest during the first month. If you have to, leave your credit and debit cards at home. With patience and a little dedication and you will learn to adhere to your plan. Debit Card or Credit Card? Which one is best for you?